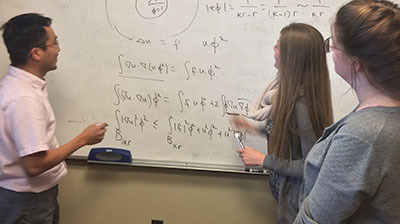 The Mathematics Department supports and develops Graduate Teaching Assistants (GTAs) though the GTA Mentorship Program. Seasoned faculty guide GTAs as they learn to be efficient and engaged teachers, who are able to use technology and modern pedagogical techniques like active classroom learning and flipped formats. The Mentorship Program provides support for GTAs through weekly meetings with the mentor, class observations every semester, and the provision of detailed course materials. First year GTAs have smaller class sizes and have workloads that recognize the additional preparation and grading time required by novice teachers. As GTAs progress through the program, they serve in increasingly independent roles as teachers of freshman and sophomore level math classes. The program provides the opportunity for GTAs to engage actively in conversations with mentors and peers about teaching and learning, get substantial feedback on their teaching, and build an impressive teaching dossier before graduation.